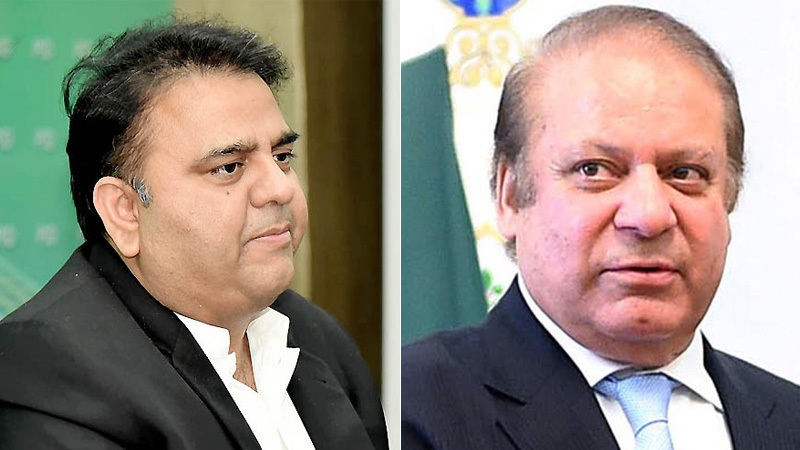 Federal Information Minister Fawad Chaudhry Sunday said that former prime minister Nawaz Sharif may leave the country after entering into a plea bargain with the National Accountability Bureau (NAB). Addressing a press conference along with Punjab Health Minister Dr Yasmin Rashid here at the Press Information Department (PID) office, he said the accountability process against Nawaz Sharif will not stop on the pretext of his bad health, adding that the Pakistan Muslim League-Nawaz (PML-N) supremo will have to return every penny of the masses before he could be allowed to leave the country. The minister said the PML-N leaders were doing politics on the health of Nawaz Sharif and trying to halt the ongoing accountability process. He said Nawaz will have to bear the brunt of his deeds and he will be held accountable for them, adding that all the cases against Nawaz Sharif were instituted during the past regimes. Rejecting media reports that Nawaz Sharif is not being provided the best medical treatment, he said extraordinary medical facilities have been provided to Nawaz Sharif for treatment of his cardiac, kidney and diabetes ailments but he refused to avail the treatment in Pakistan. He said recently Punjab Chief Minister’s Spokesman Dr Shahbaz Gill alongside senior journalist Mujeebur Rehman Shami met Nawaz Sharif at Kot Lakhpat jail to offer him the medical treatment of his choice within Pakistan but he declined. Despite Nawaz Shairf’s refusal to get treatment in the country, he said the Punjab government has established a mini-cardiac unit at the Kot Lakhpat jail with three cardiologists and three technicians available round the clock, but Nawaz Sharif has not allowed them any access. “As a matter of fact, Nawaz Sharif does not want to be treated in the country as he does not have faith in the health facilities being provided in the country which he and his brother Shehbaz Sharif built over last three decades,” he said. The minister recalled the past incident when Imran Khan fell off a staircase during the campaign for 2013 general elections. He said at that time Imran Khan refused to go abroad for medical treatment and preferred to be treated at Shaukat Khan Memorial Cancer Hospital although an air ambulance had been arranged for shifting him abroad for medical treatment. He said, similarly, Imran Khan’s late father also got all treatment from Pakistan instead of going abroad. “This is the spirit that differentiates Pakistan Tehreek-e-Insaf (PTI) and PML-N leadership,” he added. The information minister said healthcare system in Punjab is in a shambles and Health Minister Dr Yasmin Rashid is trying to revamp it. He asked Nawaz Sharif as to whom he criticizes when he complains of poor health facilities in Pakistan. Fawad said Nawaz Sharif informed the Punjab government about his ailment through a letter on January 16, 2019. The provincial government promptly got his detailed medical check-up from Dr Shahid Hameed, who referred him to the PIC (Punjab Institute of Cardiology) for his further tests. On January 22, the minister said, Nawaz Sharif was brought to the PIC where his various tests, including Eco and Thallium, were conducted. He was shifted back to the jail the same day. He said on January 25, a six-member medical board, including senior doctors of PIC, Rawalpindi Institute of Cardiology (RIC) and AFIC (Armed Forces Institute of Cardiology) was constituted. On February 3, he said, the medical board checked Nawaz Sharif at the Kot Lakhpat jail and advised for his shifting to a hospital. But the Sharif family insisted on his treatment from London, he said, adding Nawaz’s health complication has been caused by the London doctors. On the advice of the board, he said Nawaz Sharif was shifted to the Services Hospital as his primary issues were sugar and hypertension. He remained under treatment for six days, he recalled. He said Nawaz Sharif was advised to have an angiography procedure to diagnose heart problems but he refused. “On February 14, Nawaz Sharif was shifted to Jinnah Hospital where medical specialists of various diseases, including heart, were available. A coordination team comprising professors of cardiology, urology and medicines was also set up. A ward at the Jinnah Hospital was evacuated as Nawaz Sharif opted to stay there,” he recalled. “On February 24, the court rejected the bail plea of Nawaz, who on February 25 desired for his re-shifting to the jail and the administration complied with his wish,” he added. The government, he said, is fully committed to provide the best possible medical treatment to Nawaz Sharif anywhere in the country as per his choice. Punjab Minister for Industries and Trade Mian Aslam Iqbal, Chief Minister’s Spokesman Dr Shehbaz Gill and Advocate General Mian Awais were also present on the occasion.